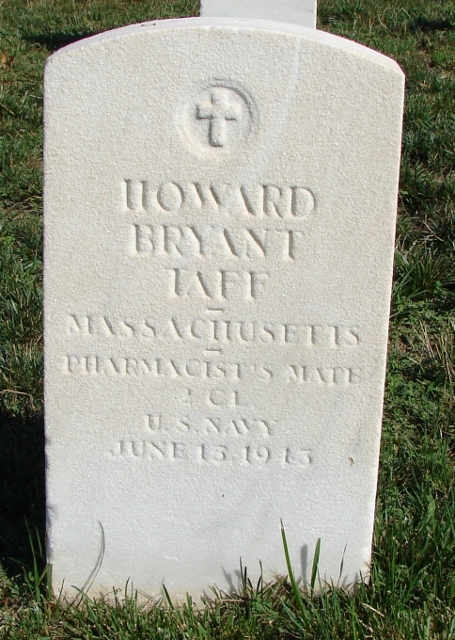 Howard Bryant Taff was my husband’s maternal grandfather and was born on December 19, 1894 in Somerville, Massachusetts as the second child of Patrick Henry Taffe and Anna Jane Smith. He had six siblings, namely: Edward Gregory, Henry Godfrey, Martha, Helen Elizabeth, Margaret Ruth, and Gertrude Rose. When he was 23, he enlisted in the United States Navy on May 29, 1917. He serviced as a Pharmacist’s Mate in WWI in France. When he was 25, he married Katherine Lydon, daughter of Michael Lydon and Margaret McGrath, in 1920 in Philadelphia, Pennsylvania. He died on June 15, 1943 in Philadelphia, Pennsylvania. Howard Bryant Taff and Katherine Lydon had only one child that lived to adulthood, Katharine Taff.